Every aspect of this unconventional tunic is nonpareil! 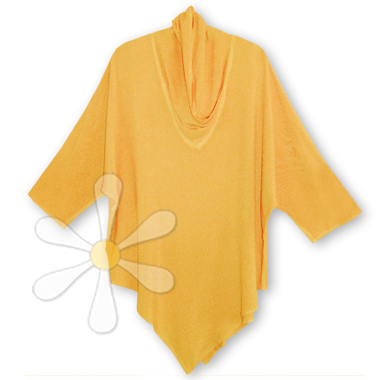 It has a flattering V neckline swathed in a draped open cowl -- a signature of our designed-for-comfort garments -- and the unique shape elongates and flatters many figures. The hem comes to a single point, both in front and back, and the elbow-length sleeves are terrifically roomy. It can be cinched it at the waist with a wide Moroccan belt or contrasting sash or scarf, or allowed to drape dreamily over your favorite pants or skirt... either way, you'll feel like the one-of-a-kind woman you are!